From bulk to retail order fulfillment, we can do it all. Our company has a wide supply chain network to provide our buyers with the product all year round and make timely delivery. Quality packing material and advanced machines are responsible for the safe packaging of the orders from our end. Moreover, our experts keep a strict vigil on the entire procedure. 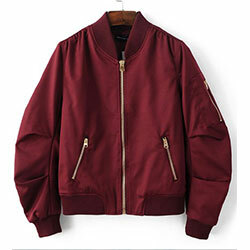 WB-2009 Bomber Jacket has a soft fabric lining with a regular fit design and high durability.